Sometimes, when you’re mediating, does your mind ever wander to memories that you haven’t thought about in years? Like a turtle on the playground? I know I’m not alone in this. This morning as I was attempting to sit quietly, my mind having other ideas as it raced around my to do list and recent life events, I found myself stumbling back through the recess of memory. I’m dropped in a field near my childhood home, one where I flew tiny kites strung together with chopsticks and yarn under the afternoon sun. A place that I spent years of my life in the pool up the hill, sunning like a komodo dragon against the concrete wall, brushing my hair out with a comb in the warm heat, and getting lost in choose your own adventure books, while games of john-can-a-po were happening poolside and the splash of water echoed in your ears. Every summer my brother and I dreaded summer fun as though my mom were sending us to prison, because really all we wanted to do was watch Saved the Bell reruns, eat food, be lazy. But alas the prison of summer fun, which as it turned out was quite cool. During lunch there was a playground, one where there was the Astroturf flooring so kids could only get minorly injured if falling off the swings or running each other into the ground. There was also a turtle, one I’d completely forgotten about until this morning when I saw myself hanging out under its concrete shell eating sandwiches during lunch with a friend. There was an opening at the bottom, under each leg, and me and a friend would wiggle through and eat our lunches there in the seclusion of our secret fort, as around us on the playground kids chirped like birds with their playground screeches. Wow, I think, even when I was young I had the theme of “home” in my subconscious. Of being where everyone else was but just out of touch, just in observation of it all. The turtle’s concrete shell was a secret cave, a place of adventure and escape. A way to have the world carry on around us and us in a place set away, an alcove of privacy and quiet. 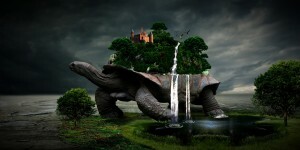 My friend Google says the turtle represent Mother Earth and signifies health and long life. Google says the turtle’s shell represents perseverance and protection. I think of that metaphor. Perseverance and protection. That I ate my lunches under the umbrella of its concrete shell. A turtle also carries its home with it wherever it goes. They can live up to 150 years. Being from Hawaii, I’d see them often in the waves. Honu, they’re called. And no, I won’t live to 150 of that I’m sure, but in my years so far I’ve searched for that feeling of home, of being able to be a part of it and also have a distance of observation. I’ve watched myself persevere, be protected, and protect others. I’ve learned to leave the safety of the shell and wander into the field where the dandelions grow and everything is possible depending on which way the wind blows. In my meditation, after the memory of the turtle, I drift to the field. It’s a field of imagination and is filled with tall stalks of dandelions swaying in the breeze. I’m lying down, back pressed against mother earth looking to the side as the stems sway and the cotton ball exoskeletons quiver. And I think: This is slow motion, like a motive, like time in honey rhythm pace, stretching and pooling. And the story I tell myself is no longer one where I persevere through tragedy, where I need protection. The story written on my eyelids when I close my eyes is that I am moving forward in rhythm, like honey, that I swoon and spin through the air like dancing florets. That my life is one in which I am always protected, home is where I am and the feeling of those I hold dear, and where the earth opens up to every possible future. And I get to choose.